The Osaka Karate Challenge Fight event was held in Osaka. The Sanpakukan kids worked very hard. Yusuke and Tatsuki came second. 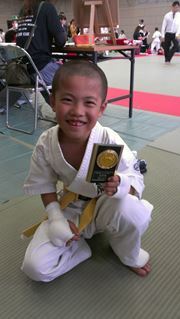 Koichiro won a prize for fighting bravely. On the 20th, a Thursday, we had tests at the Nagaoka Dojo for the younger students. This time, Narito and Yutaro got their black belts. Both of them started when they were in kindergarten and they have continued all the way. Sunday was a very busy day. In the morning it was Sports Day, then I taught Iaido, and then I went to see a Parade. I also went to see a textile exhibition, they often support me. Japanese Garden at the entrance and a wonderful kimono sash. Ikuya Naganuma, one of our students at Sanpakukan, will appear at the NHK morning series "Beppin-san", starting this week. Thank you for showing him you support. I was on the Kyoto Shinbun newspaper today (1st of October). 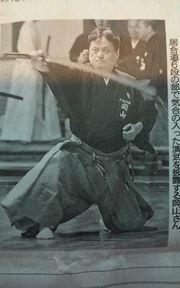 It's about my performance of the Tsuki-Kage technique at the Kyoto Competition, held on the 22nd of September. Tomorrow marks the third anniversary of opening the Sanpakukan office in its current location. Tomorrow is going to be a good day! Copyright © 館長Ryukanのささやき All Rights Reserved.